This interactive site is dedicated to Satyajit Ray’s timeless fantasy Goopy Gyne Bagha Byne (1969), and is based on his pre-production Notebooks. As you know, Ray was a meticulous Artist, and planned, it would seem, each foot of any film he was working on, in complete detail .Based on a 1914 story written by his grandfather Upendrakisore for the children’s journal Sandesh, GuGaBaBa as we came to call it lovingly ,had the longest run ever of any Bengali film. 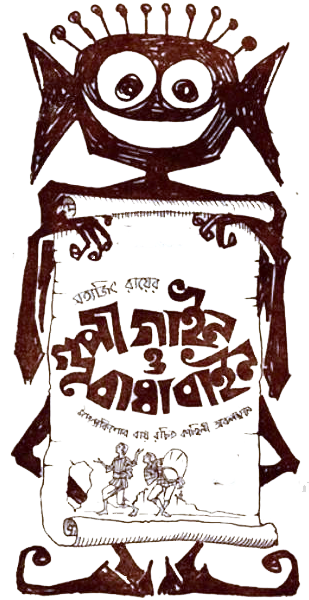 It is lyrical, it is poetic and it has also become a part of Bengali popular culture. In it Satyajit gave free rein to his yearning for Fantasy, and Music. Ray’s pre-production Notebooks are the stuff of legend. Each film had one or more Khero-khata or folding red Notebook, (commonly used to keep accounts), dedicated to it. Ray was the author of many aspects of his films. So into this Notebook went story-boards, script, screenplay, draft dialogue, sketches of sets, props, costumes ,physical details of characters, and perhaps most importantly all the songs of GuGaBaBa in both North Indian sargam and staff notation (you can actually play on this site, each line or bar that Ray was experimenting with as each song progressed). He even designed the title cards and Press publicity and lobby-cards !In our web-site we have tried to catch this wide sweep of creativity from the original Bengali story to the post release Reviews! And we have tried to make it wholly interactive, so please get back to us.